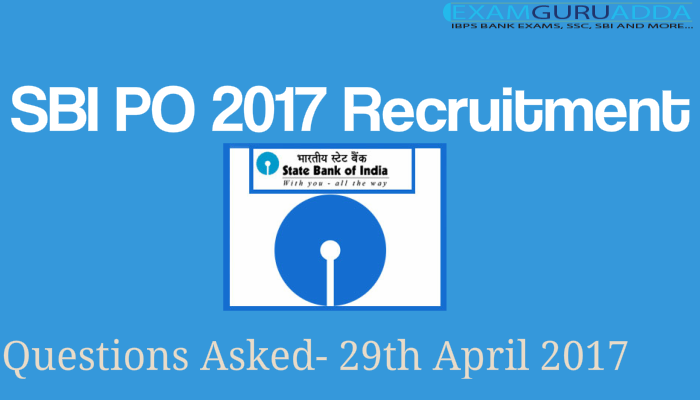 Dear Readers, The SBI PO Prelims Exam is taking place today across various cities. The will take place on 29th, 30th April & 6th, 7th May 2017 in four different slots 9 am, 11:30 am, 2 pm, 4:30 pm. 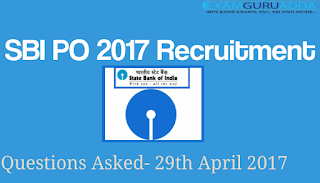 This Post covers Questions asked in SBI PO prelims Exam All shifts of 29th April 2017. Q1. B is 20% efficient than A. B started the work & do it for x days. And then B is replaced A . And A completed the remaining work in x+8 days. Ratio of work done by A & B is 2:3. In how many day A & B working together to complete the whole work? OVER a couple of days in February, hundreds of thousands of point-of- sale printers in restaurants around the world began behaving strangely. Some churned out bizarre pictures of computers and giant robots signed, “with love from the hacker God himself”. Some informed their owners that, “YOUR PRINTER HAS BEEN PWND’D”. Some told them, “For the love of God, please close this port”. When the hacker God gave an interview to Motherboard, a technology website, he claimed to be a British secondary-school pupil by the name of “Stackoverflowin”. Annoyed by the parlous state of computer security, he had, he claimed, decided to perform a public service by demonstrating just how easy it was to seize control. Not all hackers are so public-spirited, and 2016 was a bonanza for those who are not. In February of that year cyber-crooks stole $81m directly from the central bank of Bangladesh—and would have got away with more were it not for a crucial typo. In August America’s National Security Agency (NSA) saw its own hacking tools leaked all over the internet by a group calling themselves the Shadow Brokers. (The CIA suffered a similar indignity this March.) In October a piece of software called Mirai was used to flood Dyn, an internet infrastructure company, with so much meaningless traffic that websites such as Twitter and Reddit were made inaccessible to many users. And the hacking of the Democratic National Committee’s e-mail servers and the subsequent leaking of embarrassing communications seems to have been part of an attempt to influence the outcOMES. The filler were already given & you have to find the most appropriate word. Phrase Replacement – Based on Sentence improvement & Phrasal Verbs. Floor Puzzle – 8 Engineering students lives on 8 different floor of a building & studies 8 different branches of engineering. Puzzle -13 People all facing north sitting in a row. The rank of some people is given such as ram is sitting at 3rd positing & atul is sitting at 8th position. Ram, Manoj, Shiva, Aman, Rajeev, Vijay, Ravi and Rakesh are eight employees of an enterprise and they will attend a seminar in the four months (May, June, August & September). The seminar held in each month on 8th and 20th date. Only two seminars held in a month. None of the person can attend the seminar after Shiva. Aman does not attend the seminar in the month of 31 days. Rajeev and Ravi attends seminar after Aman on date 20th of different months, while Ram & Manoj attend the seminar before Aman and Manoj attends after Ram in the same month. Rakesh does not attend the seminar in the month in which either Rajeev attends or Shiva attends. Linear Arrangement – A, B, C, D, P, Q, R, S seated straight line facing north. All have different ages 14, 16, 17, 19, 21, 23, 26, 31 (not same order). B sit extreme on the end of the line. Three people sit between B and 16 yr old. 23 yr old sits second left of Q. Q sits right of 16 yr old but not immediate. Two persons sit between 23 years old and D. Three persons sit b/w 26 yr and C. C sits right of 26 yr. Neither B nor D are 26 years old. The difference of ages of neighbours of D is 5. Oldest is not neighbor of D. D is not oldest. P sits right of 31 yr old. More than one sits between 31 and 19 yr old. A sits second right of R.
. S is taller than both T & Q, but lower than R. R is not tallest & T is not Lowest. Q is taller than both U & T. Second highest is 32 cm, T is 13 cm. Arrange them according to their height. Reading Comprehension – Based on “Cyber Hacking”. Cloze Test – Based on “China Education System”. The filler were already given & you have to find the most appropriate word. Linear Arrangement – Similar to previous slot Pattern. Scheduling – 8 People having birthday in 4 differnt month & in 8 different dates. Persons M, N, O, P , Q , R, S, W have their birthdays on 10th and 27th of four different months i.e March, April, May, June not necessarily in the same order. M has birthday on 10th of a month which is having 31 days. Only one person has birthday before N. Number of persons between M and N is one less than the number of persons between N and W. O and P were held in same month having 30 days ,but not in April. R has birthday after S. Only three persons have birthday between N and Q. O was held before P.
Reading Comprehension – Based on “Vulnerability of Online Banking”. Cloze Test – Based on “Employment”. The filler were already given & you have to find the most appropriate word. The future looks increasingly (1)_____ [optimistic] for the human worker. New robots are no longer flummoxed by staircases and doorknobs; clever software is capable of driving cars on (rudimentary) conversations. While a workless world remains a distant (2)______ [risk], a period of automation – driven disruption seems to (3)_____[exponse] ahead. Many futurists (4)____ [account] that as machines replace, governments will need to find ways to redistribute income from the machines (and the people who own them) to displaced workers, to ensure that the benefits of automation – driven growth are (5)____ [excluded] widely. In a recent interview Bill Gates proposed one method for doing this: a tax on robots, the money from which could be used to retrain workers and expand employment in healthcare and education. But is this the right response?